U.S. Secretary of State Rex Tillerson (R) meets with Pakistan's Foreign Minister Khawaja Muhammad Asif at the State Department in Washington, U.S., October 4, 2017. WASHINGTON - Pakistan’s foreign minister on Thursday described as “hollow allegations” comments by senior U.S. officials and lawmakers during his visit to Washington this week that questioned Islamabad’s resolve in fighting militancy. President Donald Trump’s administration is seeking to implement its regional strategy. While U.S. officials have long been critical of the role Pakistan has played in Afghanistan, senior officials have been more pointed in recent days about Islamabad’s alleged support for militant groups. Earlier this week, U.S. Defense Secretary Jim Mattis said the United States would try “one more time” to work with Pakistan in Afghanistan before Trump would “take whatever steps are necessary” to change Pakistan’s behavior. On Tuesday, the top U.S. military officer said he believed Pakistan’s main spy agency, the Inter-Services Intelligence (ISI) directorate, had ties to the militant group. “You want us to sniff them out, we will do that. 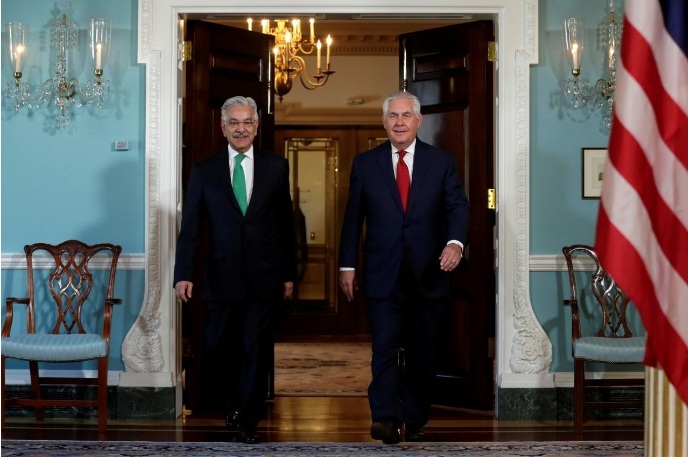 You want us to take action against them, whatever action you propose, we will do that... (but) these hollow allegations are not acceptable,” Pakistan’s Foreign Minister Khawaja Asif told a group of reporters. In August, Trump outlined a new strategy for the war in Afghanistan, chastising Pakistan over its alleged support for Afghan militants. Reuters first reported that possible Trump administration responses being discussed include expanding U.S. drone strikes and perhaps eventually downgrading Pakistan’s status as a major non-NATO ally. Asif singled out Senator John McCain, chairman of the Senate Armed Service Committee, saying the senator was “playing to his constituents” when he criticized Pakistan. “We are not saying we are saints. Perhaps in the past, we made some mistakes. But since the last three, four years, we are wholeheartedly, single mindedly, we are targeting these terrorists,” Asif said. Asif said that Pakistan had less influence over the Taliban than in previous years, which could impact any efforts for peace talks to bring an end to the war in Afghanistan. He added that U.S. Secretary of State Rex Tillerson would be visiting Pakistan later this month. Pakistan’s foreign minister on Thursday described as “hollow allegations” comments by senior U.S. officials and lawmakers during his visit to Washington this week that questioned Islamabad’s resolve in fighting militancy.